Kong Hyo Jo the versatile actress from many korean dramas like Biscute Teacher Start Candy, Pasta, The greatest Love, The Master Sun, Its Ok That's love, Producer & Jealousy Incarnate. Her every character was memorable but the character fr Pyo Na Ri really nailed her versatility. When ever we watch the news specially the session of weather forecast we reminded of Kong Hyo Jo as the weather forecaster Pyo Na Ri. It will be great to see her in another role as the music teacher a violinist in movie A Single rider. The plot gives the signs towards the music story which will be fun to watch out. The story revolves around the life of Jae Hyun a well known name in fund manager for the well known company which goes bankrupt afterwords. This case shocks the country, he then visit his family in Australia after losing everything. Also he wanted to find the truth why this happened. 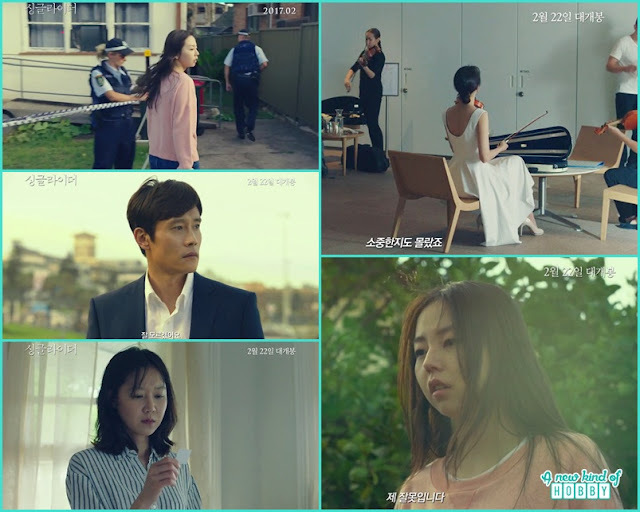 Jae hoon suddenly disappears and then seen in Australia he found his wife and son living happily in his absence this makes him suspicious when he saw the effectionate relationship with the Australian neighbor Cris. He then decided to stay away and find the evidence of his wife affair. Life become too tough for him he lost his job, the company goes bankrupt, the trust of his family broke down. Her wife Soo-Jin (Kong Hyo-Jin) was the ex-violinist who lives with her son and was unaware of her husband presence in Australia. Ji-Na (Ahn So-Hee) another character appears who was a university student. She arrives in Australia on a working holiday visa. The three of them were bound in the same circumstances and destined to meet somehow. We are curious to knew their connection. Our only curiosity how will they connect and make a plot. From the trailer we can tell it will be definitely a good film with the convening story having the element of relation, doubts, affair and the truth. Looking forward to watch out a suspense filled A Single Rider.